The day of the show. I was up and pack by 6.30am for the drive to the show. Left home at 7.00am and arrived at 7.08am. Hung around till 7.30 when the show organisers turned up. (Must read invite). The show venue is great. Plenty of free parking and all on the level. In fact as I was one of the first to arrive I was allowed to drive into the venue and park next to the table to help unloading. The other great benefit is that they also have access to a professionally run café. So once I had set up and then the others turned up, we went for breakfast. There were a very good selection of traders. 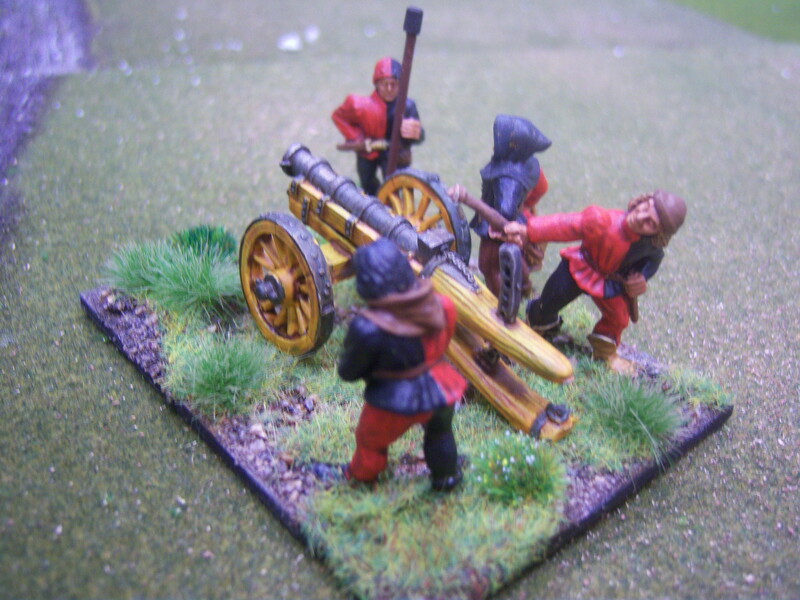 Having sold my Grand Manner builds of Cartentan to fund the War of The Roses collection I was either in the market place for some alternatives that were hopefully cheaper, lighter to carry and less fragile or sell my WW2 28mm collection including my Dad’s Army troops. Well Charlie Foxtrot models offered me the solution. A vast selection of models are already available and having had a discussion with the owner regarding future releases, he confirmed plans for at least a School, funeral parlour and many more ideas. Please check out their website. http://www.charliefoxtrotmodels.com/ it is really good and offers tutorials on assembly etc. 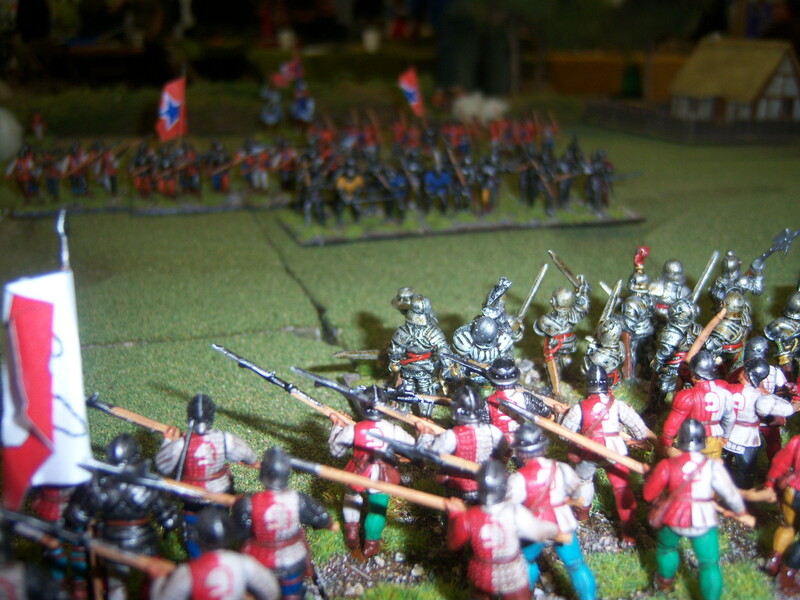 The game was based around the forces involved at Bosworth. The boys from Plymouth, Brian and Laurie turned up and along with Nathan they selected the forces they were to command. Nathan taking the Yorkist force while Brian and Laurie commander the Tudor force. 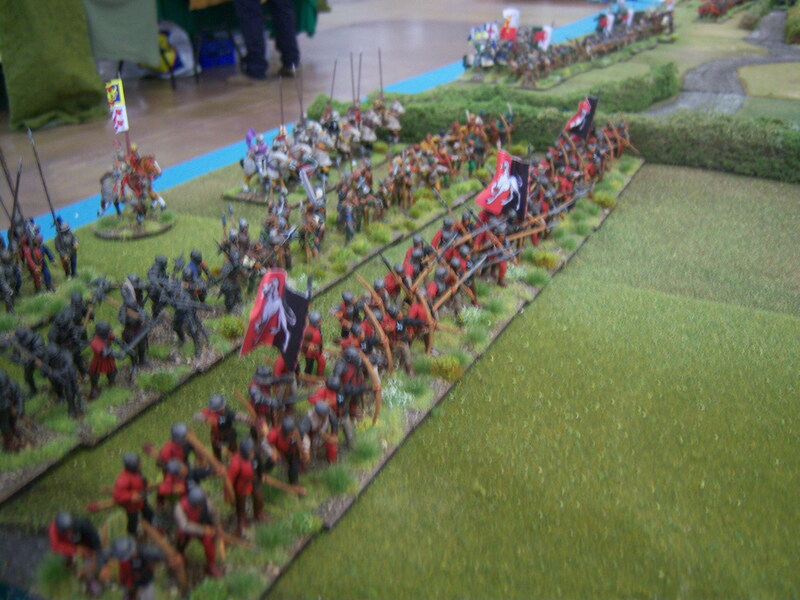 I have to admit that it was at this time we decided that the Stanley forces of Sir William and Thomas would be for show. They can be seen below skirting the edge of the far river bank. 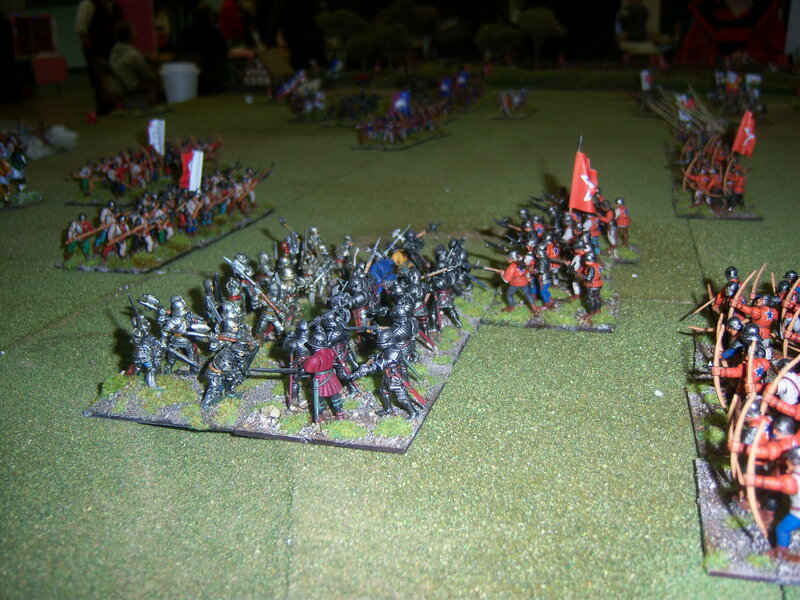 Both side started to advance towards each other and the first to engage were Oxford’s mounted knights against Surrey’s knights. This melee ebbed and flowed for a while until Surrey reinforced the melee. 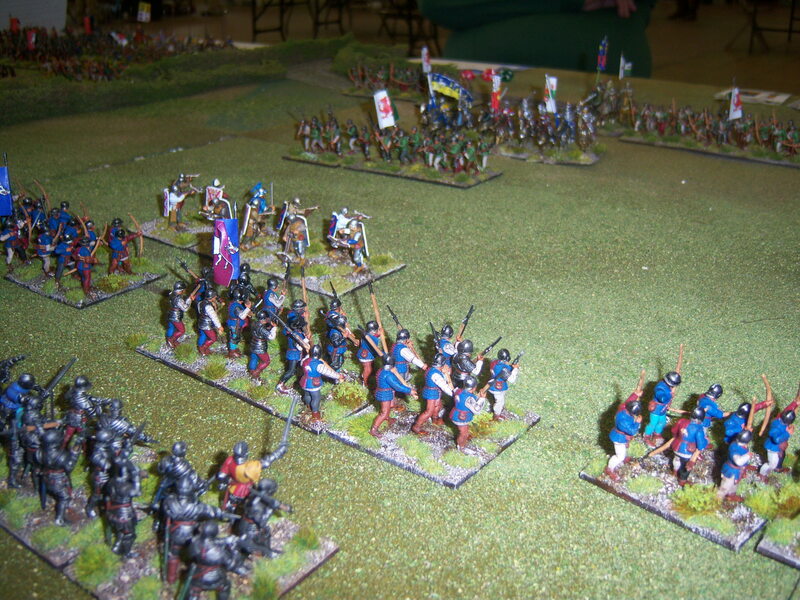 This opened up the Tudor left flank and forced Oxford on to the defensive. 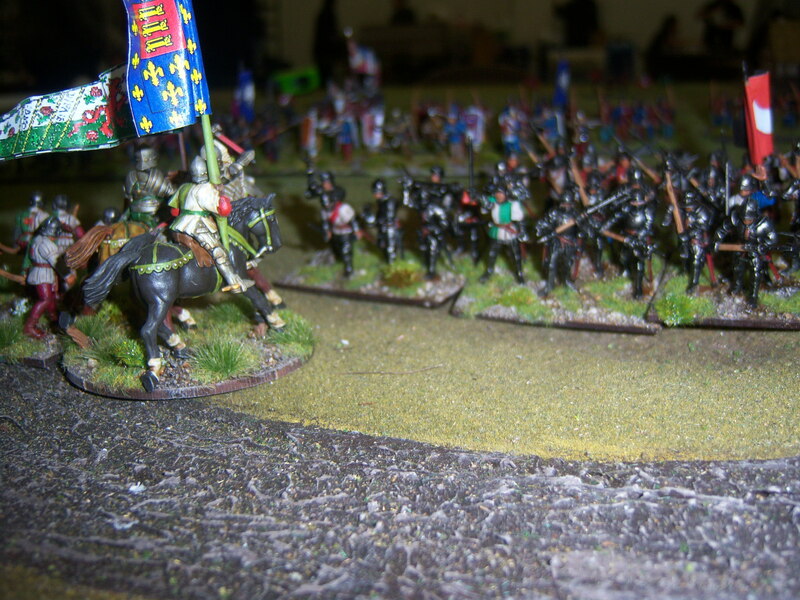 Surrey’s troops continued to advance and engaged Archers, Billmen and dismounted knights finally fighting all the way to Oxford himself where he was heroically dragged from his mount and killed. 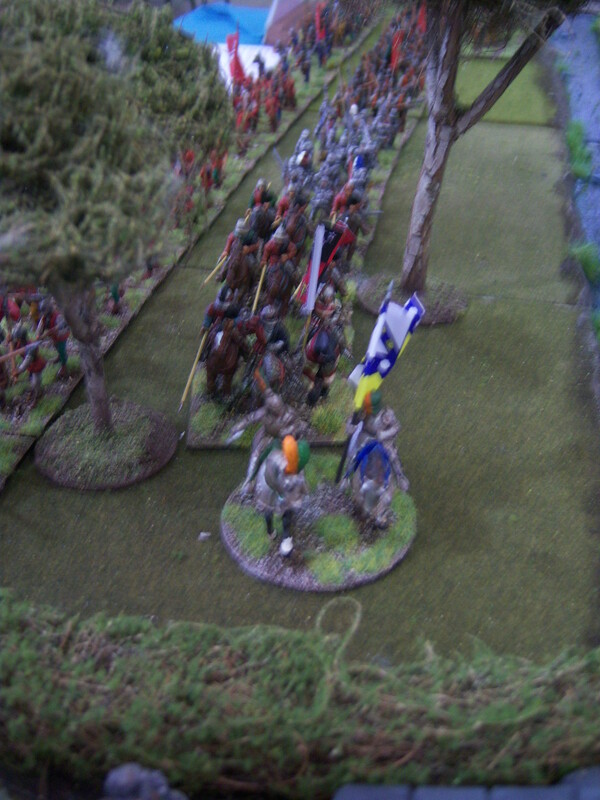 This put pressure on the Tudor centre which was taking casualties. 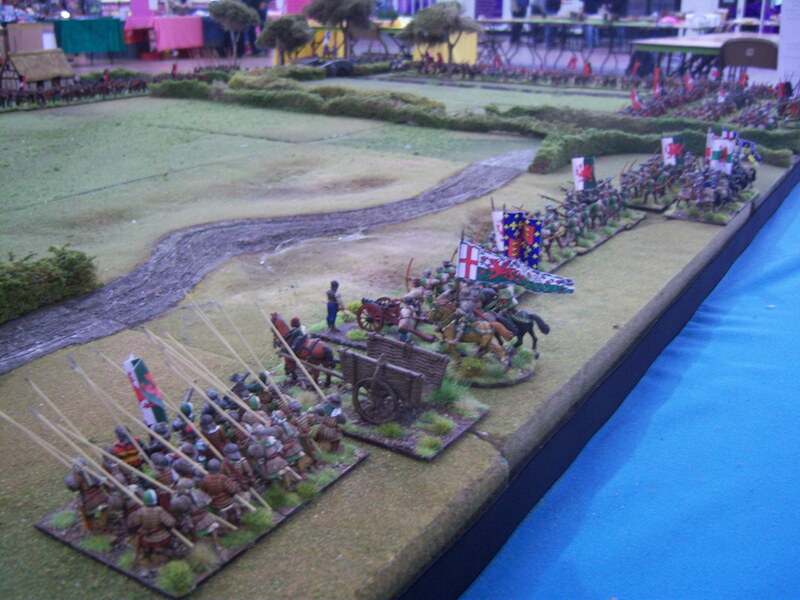 Shrewsbury tried to turn his troops to support his army’s centre but too late. Henry was hunted down and killed. 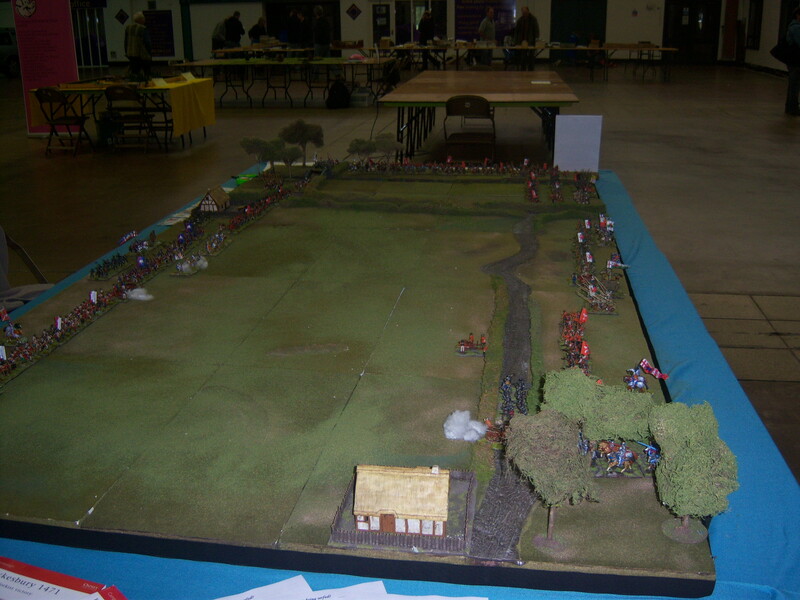 Everybody including gamers and viewers seemed to enjoy the game and the rules sparked a bit of interest. 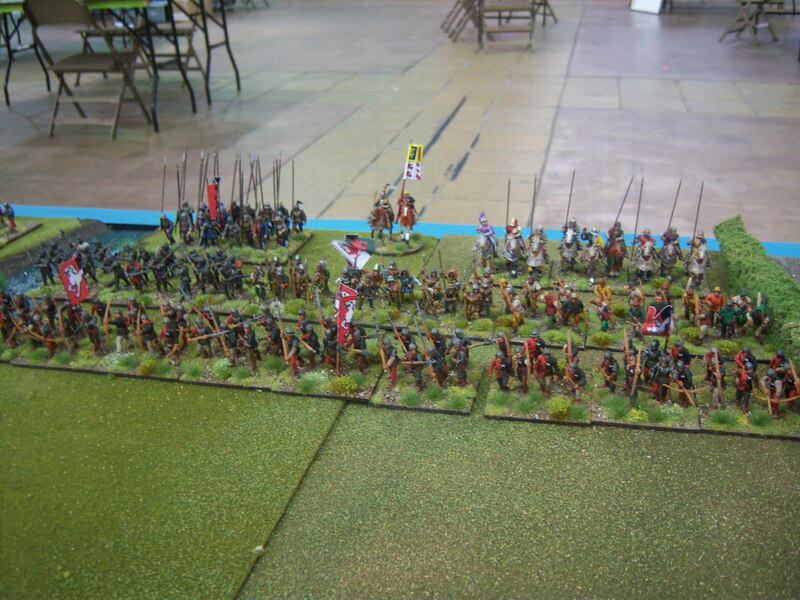 With a 1000+ troops on the table it played really well. We did change a few aspects of the rules afterwards and I will publish an updated version later this week. I apologise for the quality of some of the shots but for some reason the normally reliable camera seemed to be playing up on the day. 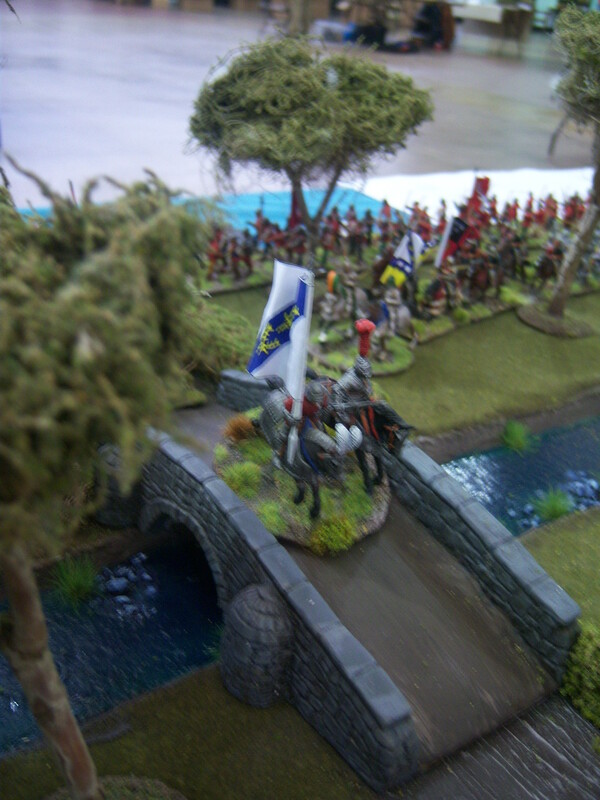 WSS and Wargame Illustrated were both at the show so hopefully they may publish some better shots of the game. 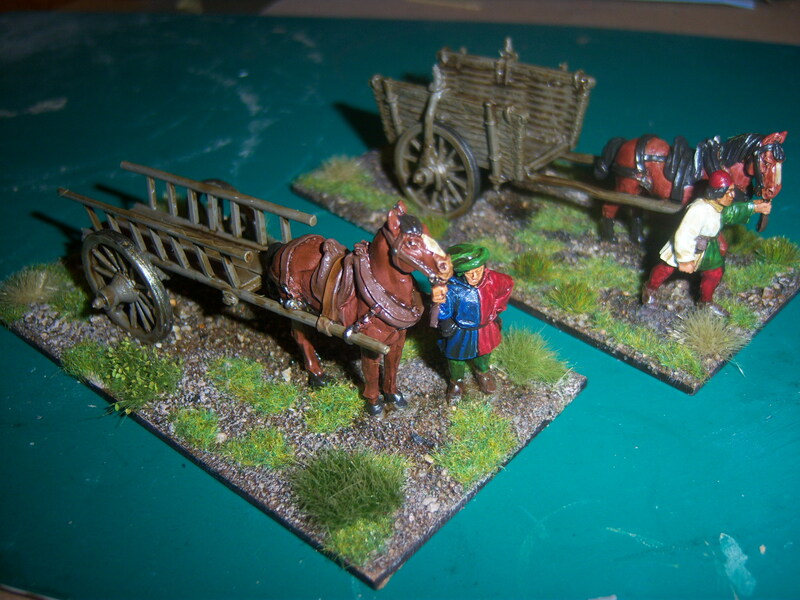 Tudor’s Battle with supplies cart. 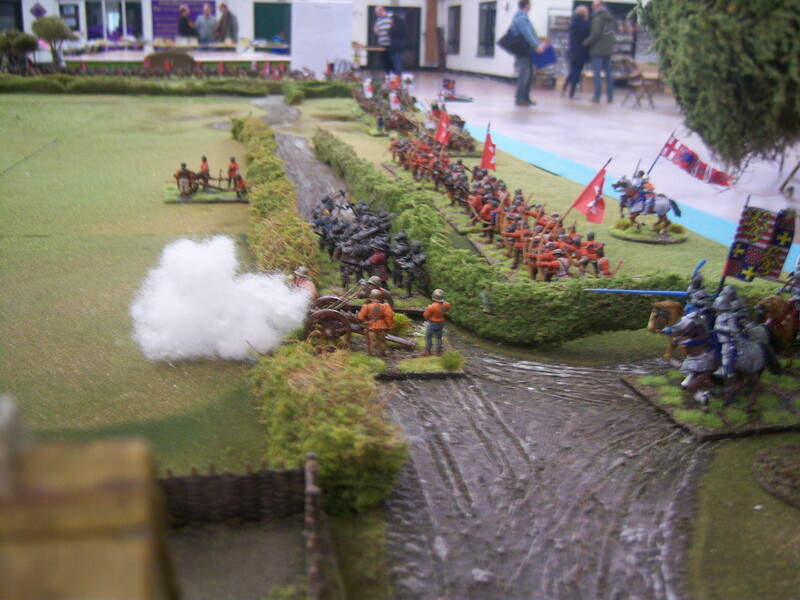 Surrey’s dismounted men at arms start to steam roller through Oxford’s troops. 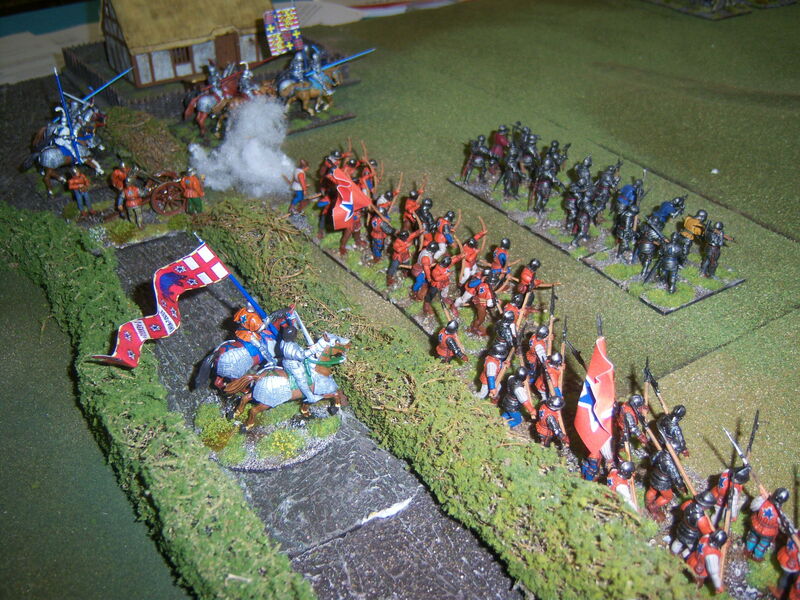 Northumberland’s troops close down on Henry in a similar way to Richard was hunted down in real life! 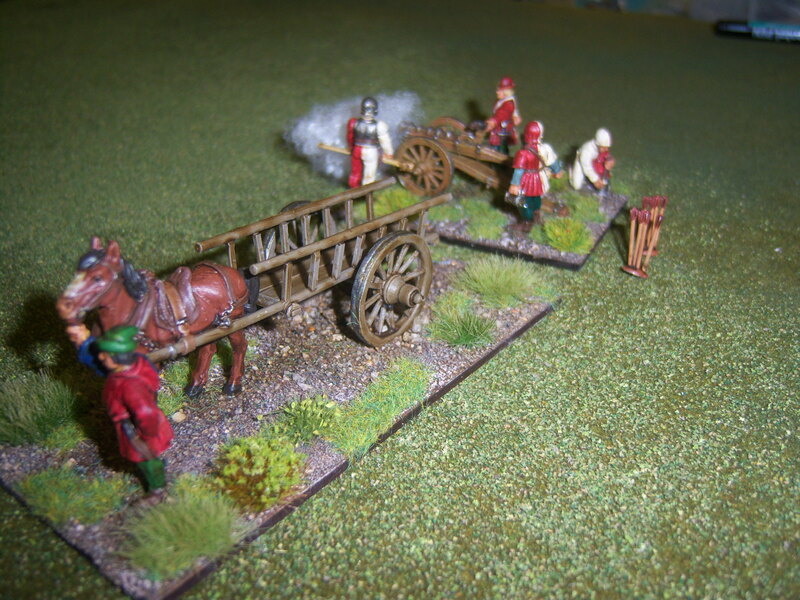 Ricard’s supply wagon provides much needed ammo to Surrey’s gun. 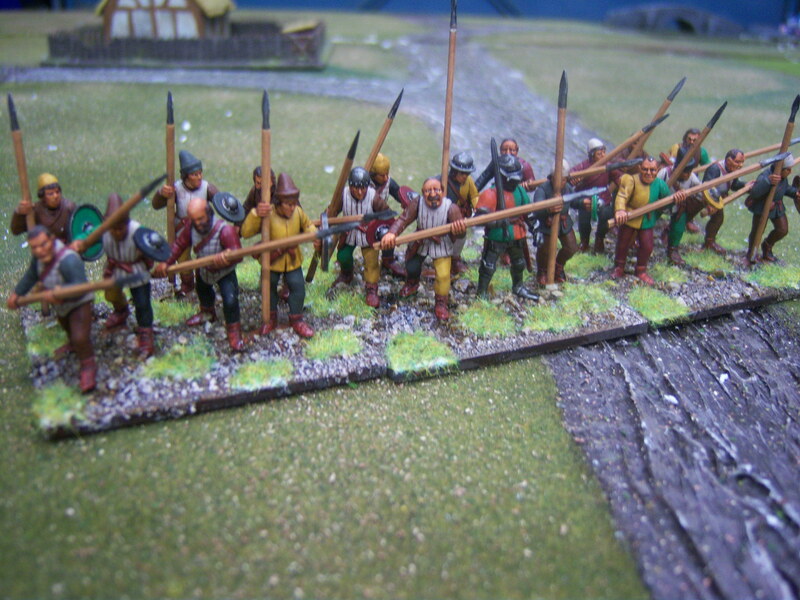 Surrey’s troop engage Oxford’s billmen. 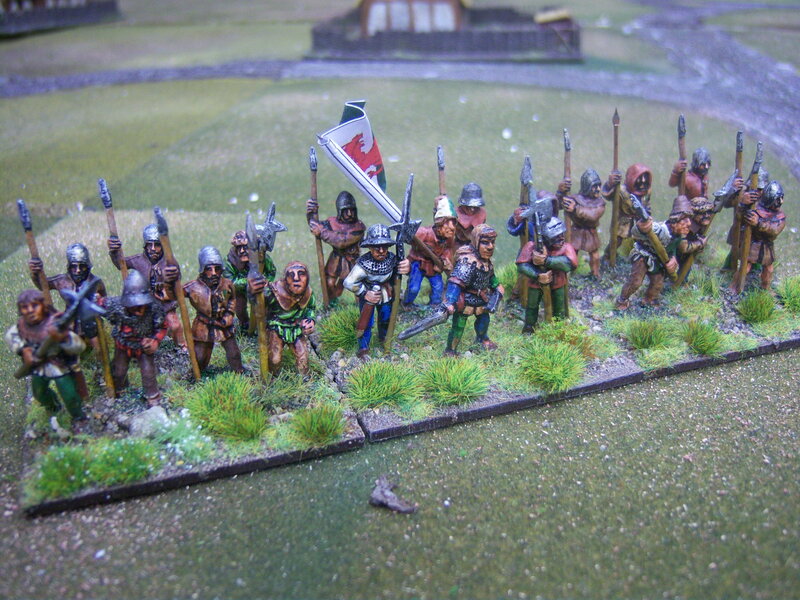 Oxford supporting his archers who have been contacted by Surrey’s Men at Arms. 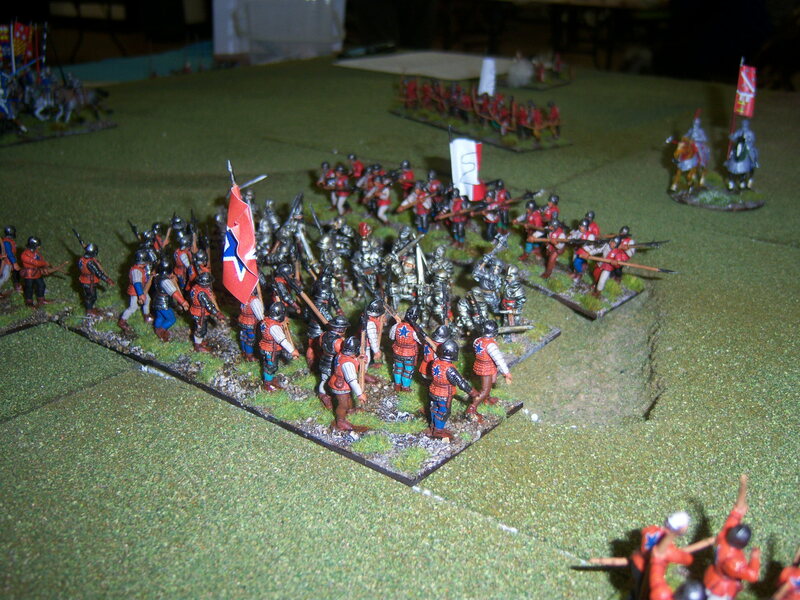 The Tudor left flank after a strong start, starts to break up. This is a desperate last chance. 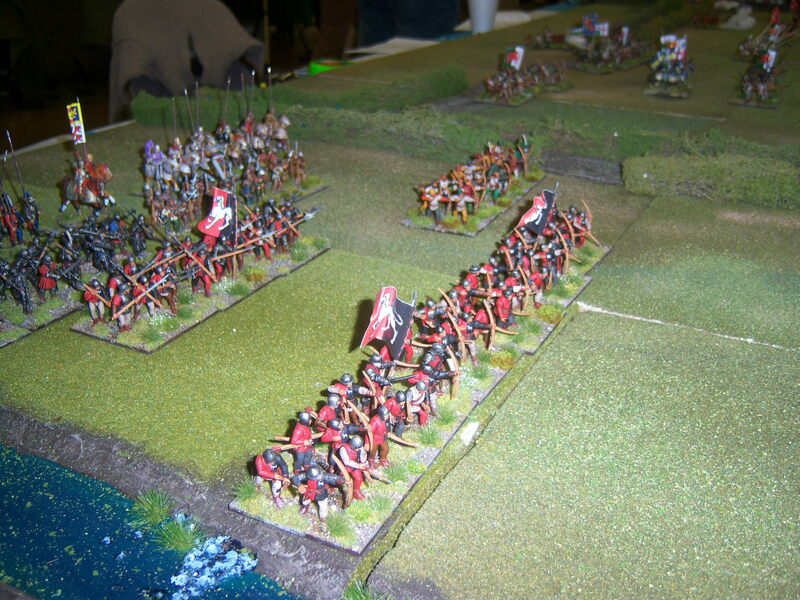 Northumberland’s troops start to advance again, protected! 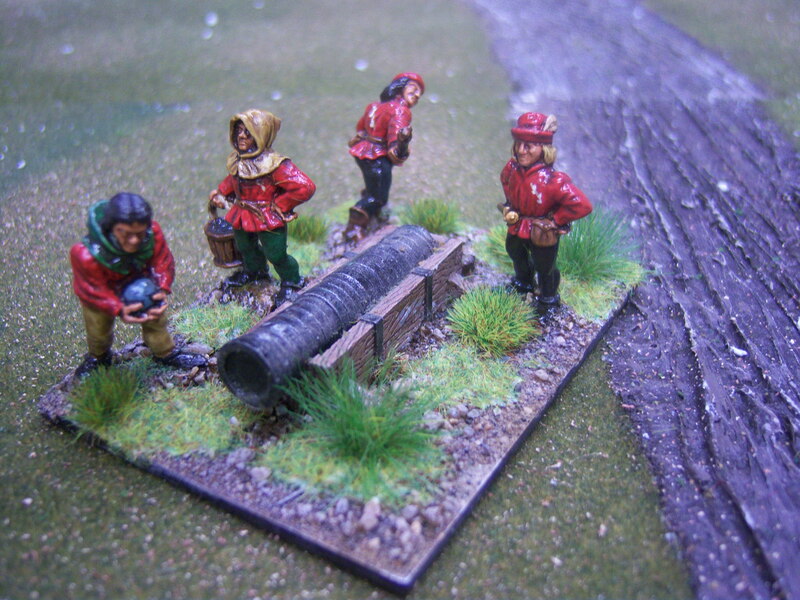 by Burgundian handgunners. Surrey’s troops looking across towards their target, Oxford. 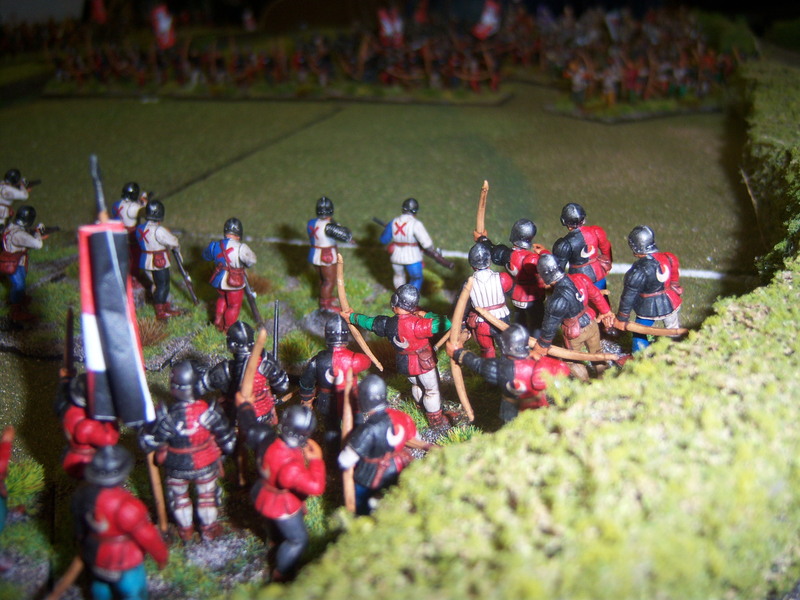 Shrewsbury starts to swing his troops to support the Tudor centre. Too late to save the day though! Here is the next instalment for the Are You Being Serfed rules, a record sheet. This should keep the need to have any reference markers etc. on the table to a minimum. 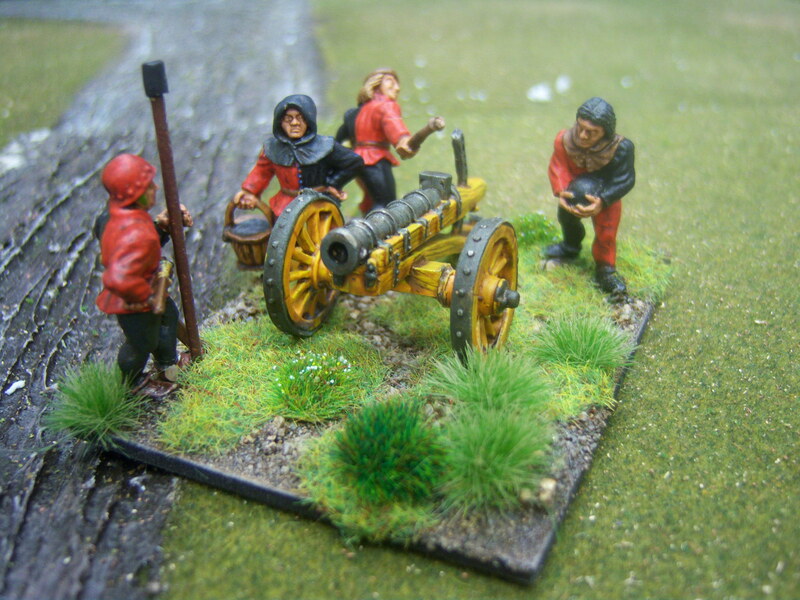 The only exception being possibly reload markers for artillery. For this we use the arrow clumps from the Perry box sets placed behind the base and remove one for each reload actioned. Pretty self-explanatory but any issues drop me a line. Below you will find a pdf version and an Excel version for you to edit if you wish. 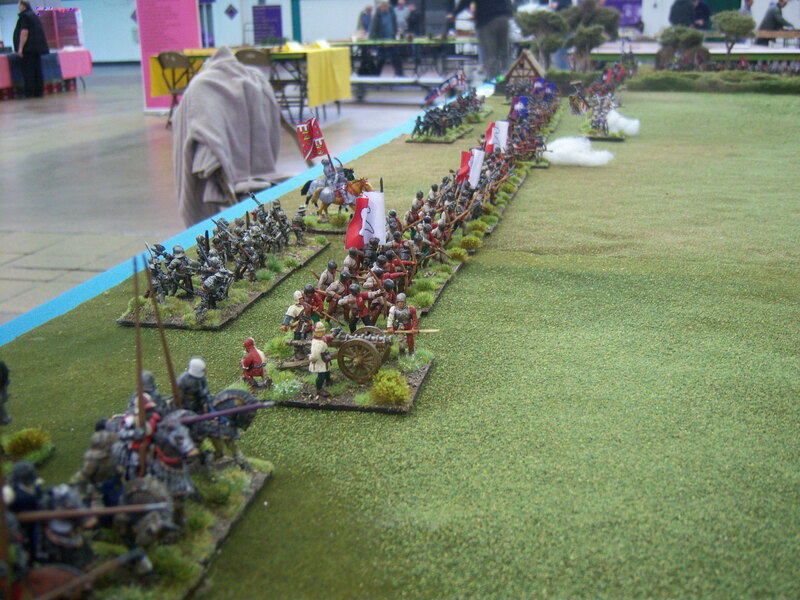 Sample Army Lists for War of the Roses rules AYBS. 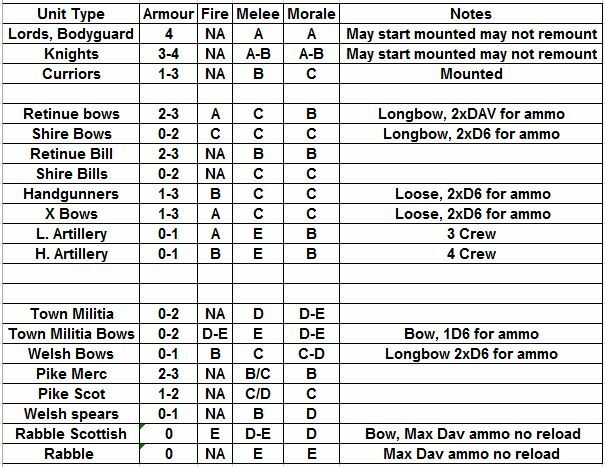 As promised, I said I would add some army style lists. you think something is missing please add it. I will do the record sheets next. Sorry it has been a while but I am just recovering from flu. No, not man flu but real flu. It floored me for over a week. Even though I have been feeling better for about a week it still sapped me of any enthusiasm. 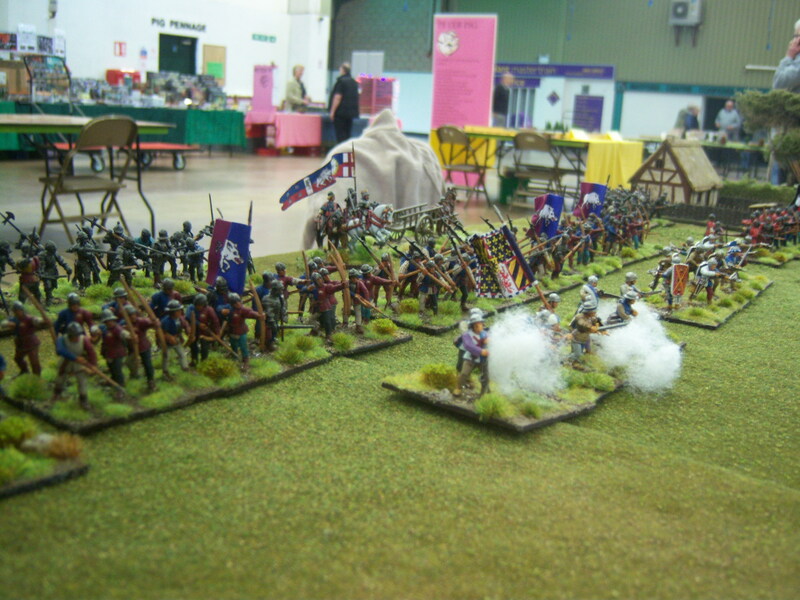 What I have done to get back into the flow is to work on the rules we will be using for the demo game I am putting on at legionary on the 2nd May 2015. If you have looked at any of the other rule sets we use, you will soon become familiar with the processes. I make no apologies for them. I believe they will give a fast and fun game. We are going to have in the region of 40+ units, 800+ figures on the table and with possibly only 2 players they need to be. In the next few weeks I will add some more supporting paperwork for record keeping and I am also working on a random army generator so should also have some army lists. In the meantime here are the rules, I hope you enjoy them. I have read through them a couple of time so I hope they make as much sense to you as they do to me. They do not cover every eventuality but if you enjoy these types of rules then it will not be an issue for you to work it out with the rest of the players. These are to have a laugh with but give a good sense of play. If you are a player who plays to the rules rather than the spirit of a game, please avoid them like the plague. If you have any questions please drop me a line. A bit of a push on over the weekend. Below are some shots of some more units I finished over the weekend. 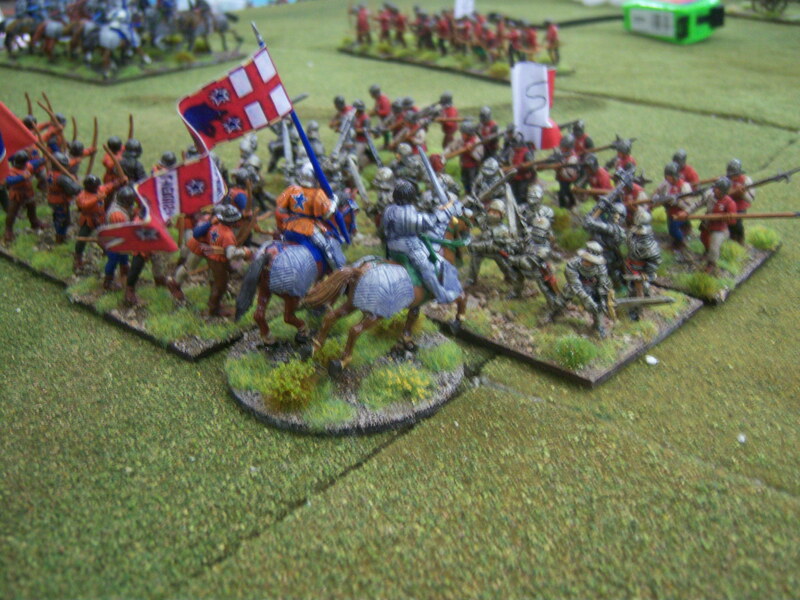 These are mainly Old Glory figures with a few Foundry in the front rank. One of the house rules I have added is the ability for units to run low on ammo. This add a -1 on their ability to hit. I decided it would look good on the table to have some sort of ammo resupply. So if these carts are moved next to a low on ammo unit they may restock on arrows etc. I have given the wagoner an outfit in a battles livery colour without any specific badges. 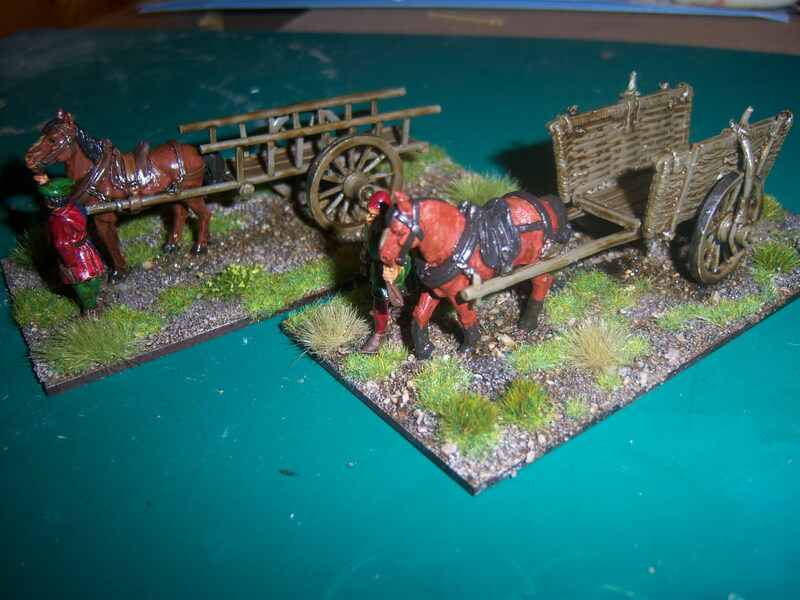 As I stated in an Earlier blog I had to do a mounted command version. well here he is. 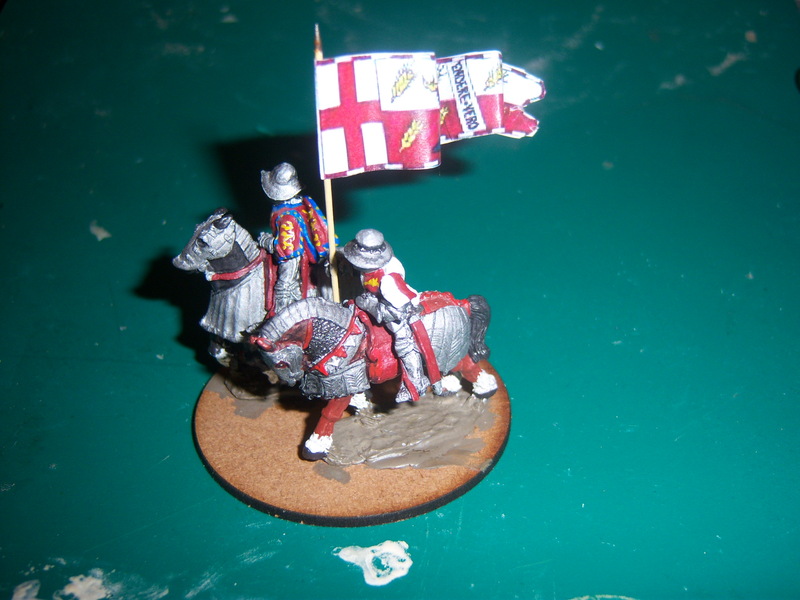 These are Foundry figures with a home made flag. All I have left to do is the basing. Think I need a week off painting. 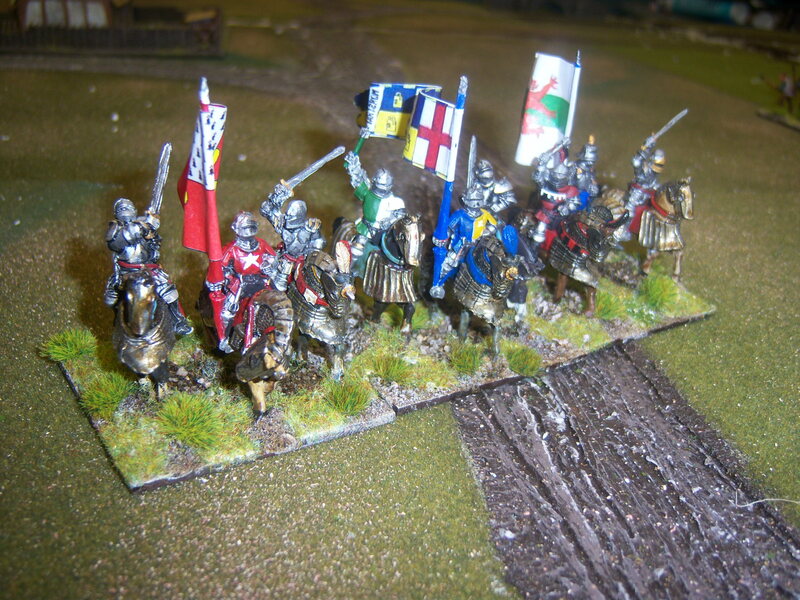 More War of the Roses – the Welsh are coming! The other week another few units turned up from Alan Hunter at Deadkingsrise painting service (http://deadkingsrise.blogspot.co.uk/). He is helping me out by providing a few! units to go with my own growing collection. 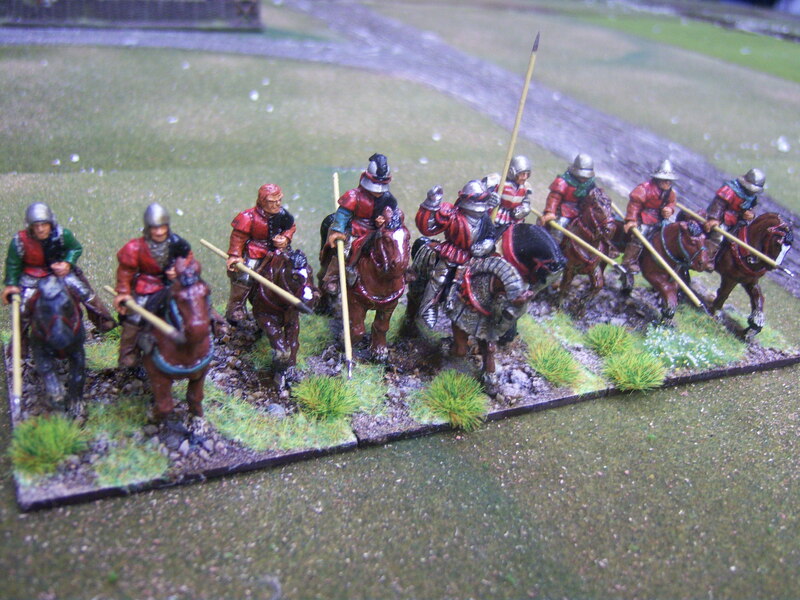 3 units of dismounted knights and a unit of Welsh spearmen turned up this time. So far I have only based the Welsh. 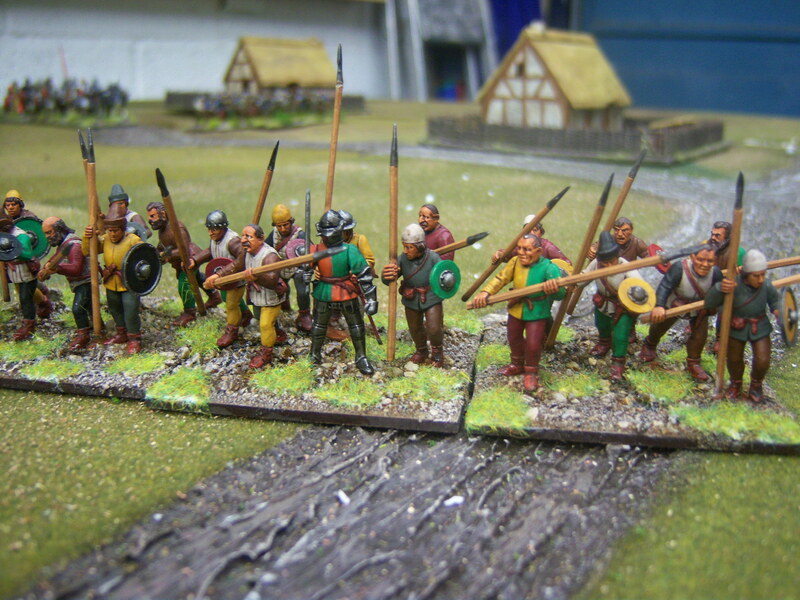 These are Perry plastics with alternative heads and a few spears from other manufactures. I really like them as they do give an impression of a hastily formed unit. 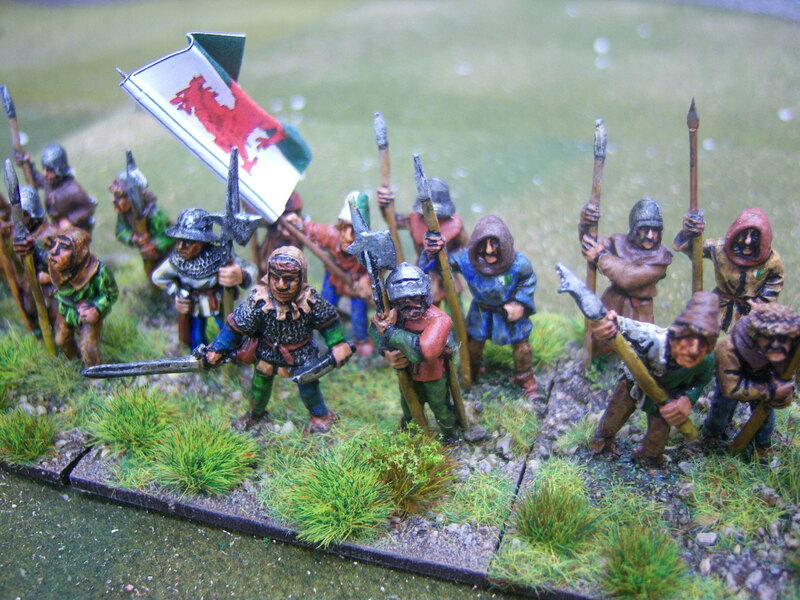 There are 2 units of Welsh archers still to come to help support these. 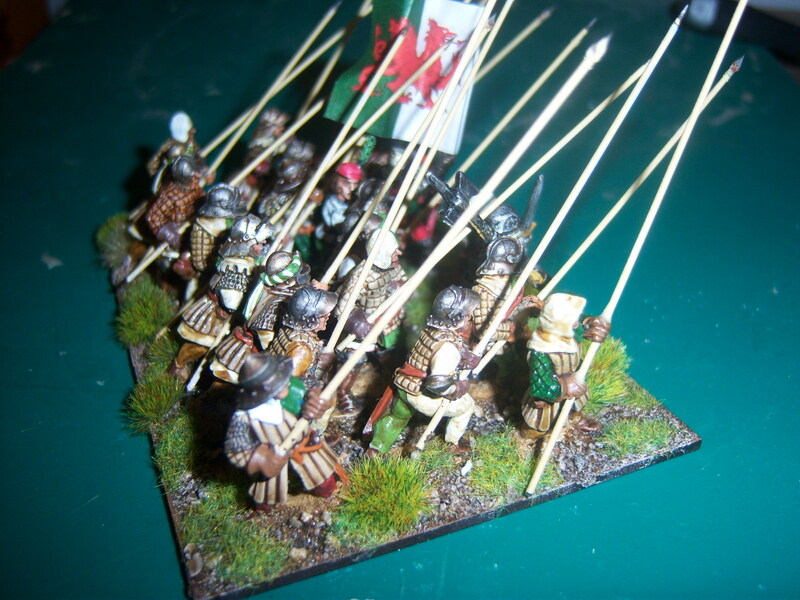 The bottom two pictures show a Welsh spear unit I have painted to go side by side with this unit. Here is my unit. They are foundry. Just a little update on some more painting I have been doing for my game at Legionary 2015 (http://www.exmouthwargames.org.uk/). 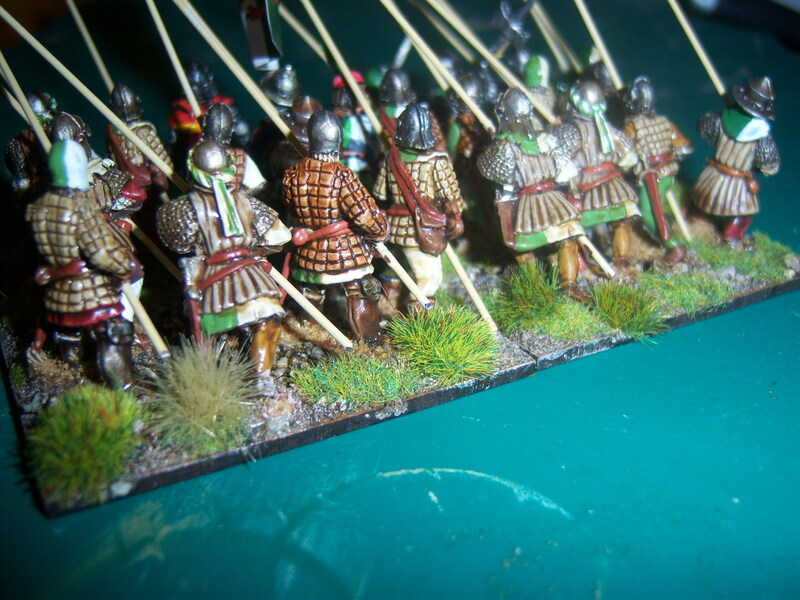 Below are a few photos of units I have painted in the last month. 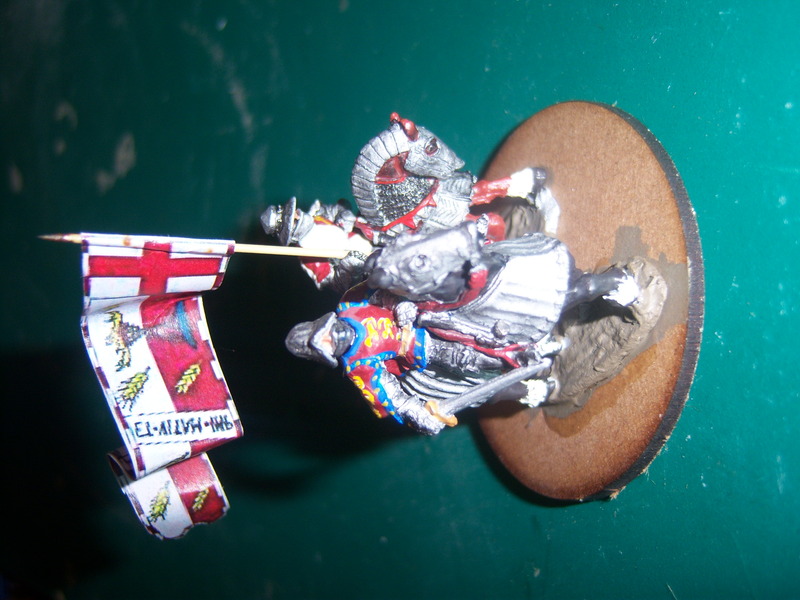 1 unit of Old Glory mounted knights- These are very animated figures, including the horses which could be considered a little too thin for my likings but they at least fit in with the foundry metals I have. 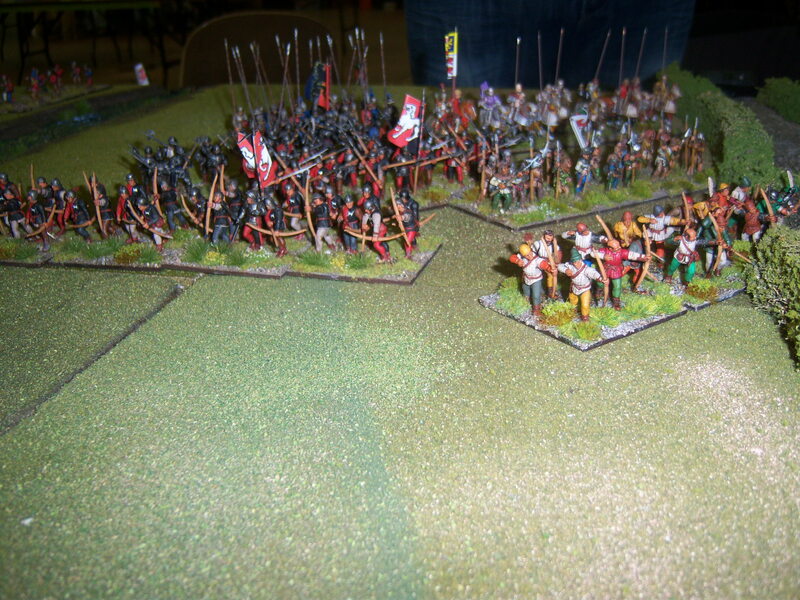 2 Artillery bases – These are Front Rank. 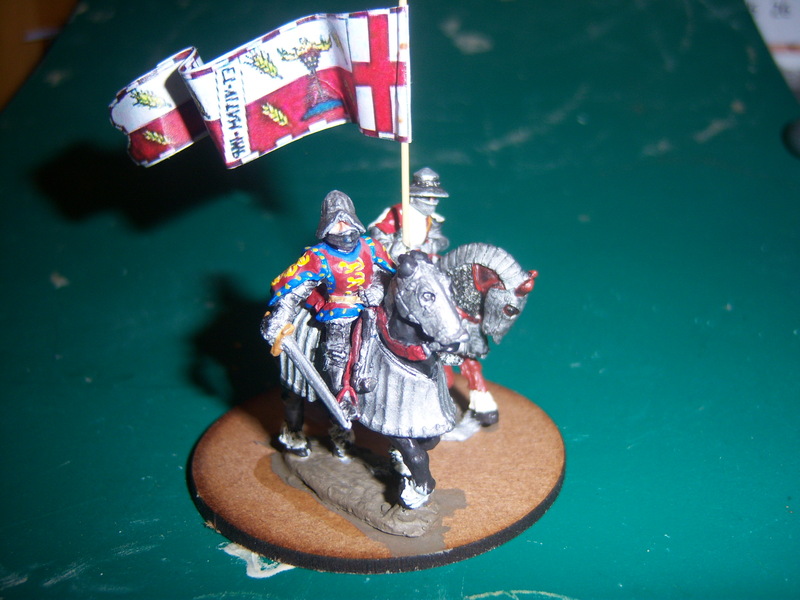 I have to admit that these are the only front rank figures I have and will be the last for my War of the Roses armies. They are OK figures but so out of scale with any other manufacturer I have, they may not even make it to the table. One base is painted to represent Warwick and the other with the red/black livery will be ideal for Shrewsbury or Northampton. 1 unit of Northern Horse. These are Foundry. These are also done in the red/black livery so will be ideal for Shrewsbury or Northampton and probably many others. 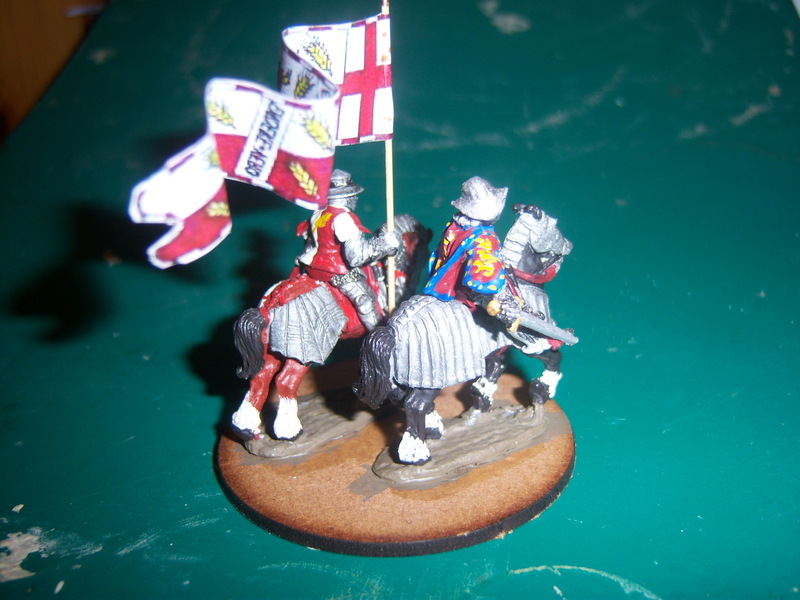 I have decided to not put livery emblems on the figures and to use a Banner. 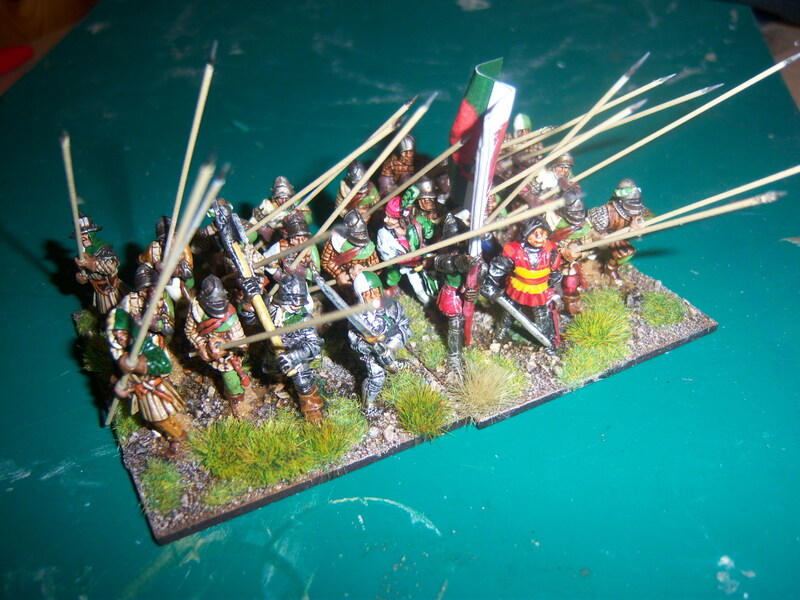 The trick is to wrap the banner around a small tube/pipe and slide it over the standard-bearer’s spear. I have found that a cotton bud with the ends cut off is ideal for this. 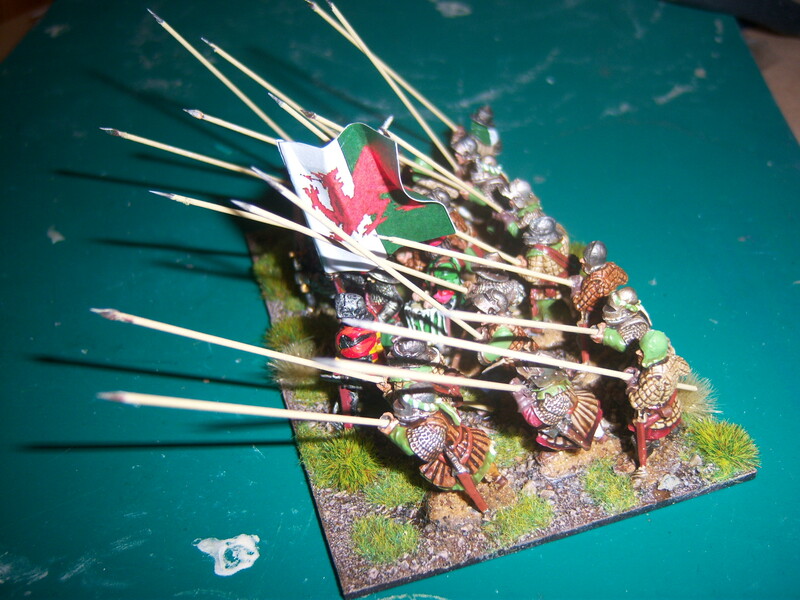 Then when you need a unit on the oppositions side, just swap banners.